A one-stop streaming audio solution to convert DRM-ed audios, including Apple Music songs, iTunes & Audible audiobooks, as well as non-DRM audio files to MP3, WAV, FLAC, AAC for playing on any device. No matter what kind of audio files you collected, whether it's DRM-ed track from Apple Music or iTunes, or AA, AAX audiobook on Audible, or even common audio file format like MP3, FLAC, WAV, OGG, AudFree DRM Audio Converter for Mac would always be your best assistant as it can completely get rid of DRM restriction and convert the protected and non-DRM audios to popular file formats so that you can freely enjoy any music anywhere at anytime. Because of DRM, Apple Music streams can only play well on authorized devices with limited number. Now with this professional Apple Music converter, you can permanently remove DRM from Apple Music as well as iTunes purchased M4P songs. In other words, you are able to keep all your Apple Music songs in your iTunes library forever and get access to the music even after you cancelling Apple Music subscription. AudFree DRM Audio Converter for Mac can also act as a powerful DRM removal tool for audiobooks which can completely delete DRM protection from iTunes M4B, M4A and Audible AA, AAX audio books with zero quality loss. 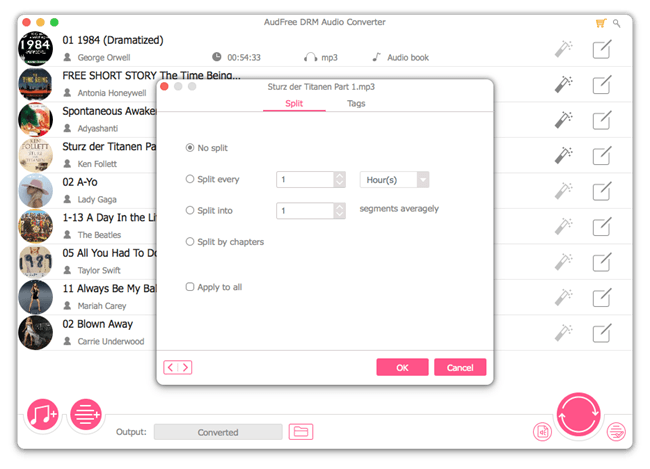 By converting the DRM audiobooks to DRM-free formats with this reliable audiobook converter, you are able to listen to any audiobook on all popular devices in no time. 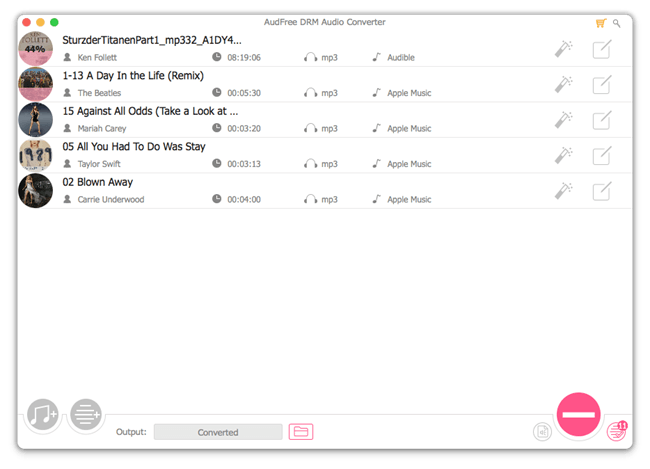 While decrypting DRM, AudFree DRM Audio Converter for Mac also gives you the ability to convert the DRM-ed Apple Music M4P songs, playlits, iTunes M4B, M4A books and Audible AA, AAX files to MP3, AAC, WAV, FLAC, M4A, M4B and other plain formats. If however your audio collection is not protected by DRM, you can also use this smart toolkit to convert the audio files to other formats with one click only. 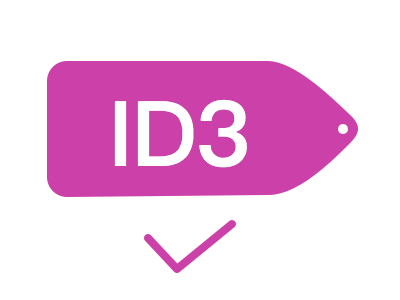 As an intelligent DRM audio tool, AudFree can not only encode audio formats, but also keep the original metadata info and ID3 tags in the output files, including chapters, album, title, cover, author, genre, date and more thanks to its inside ID tags editor. For audios with no ID tags, you are also allowed to fix and edit the info manually. In addition, to make you music more personalized and organized, you can change primary audio parameters like audio bit rate, sample rate, codec, channel, etc. of the audios based on your favorite music taste. Proceed swiftly at up to 30X super faster speed in converting Apple Music, Audible audiobooks and other audio tracks. 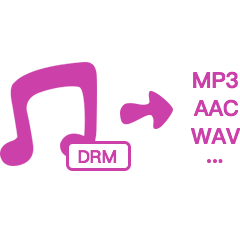 AudFree DRM Audio Converter enables you enjoy any type of music on multiple popular players offline, such as iPod, iPhone, Zune, etc. The built-in splitter allows you to cut large audiobook into small clips either by chapters or fixed time interval. 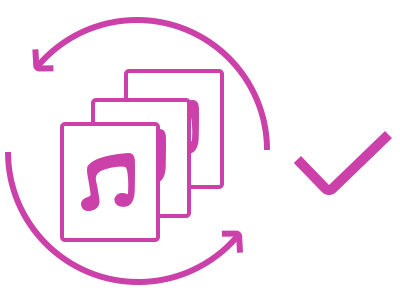 Batch conversion is perfectly supported so that you can add hundreds of songs and tracks to convert once. Main user interface of AudFree DRM Audio Converter for Mac while adding the audios. Choose output format and other parameters before converting the audio. You are allowed to split the audios and edit ID3 tags within the app. Click 'Convert' and it will begin to convert DRM-ed audios to common formats. 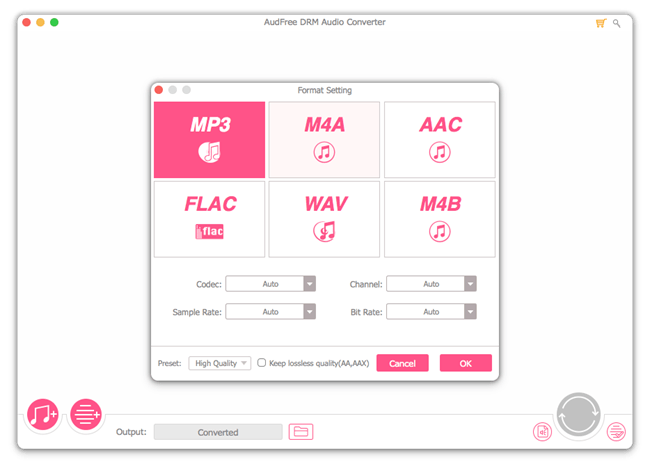 How to install AudFree DRM Audio Converter?